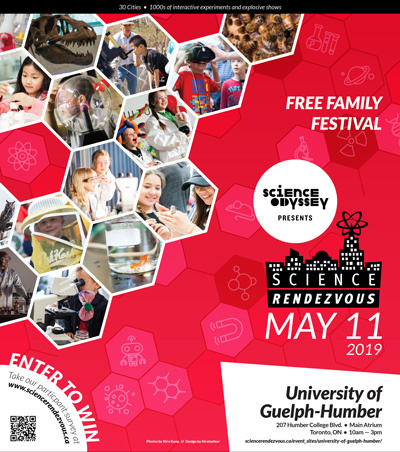 Time: Activities will take place between 10 a.m. – 3 p.m.
On Saturday, May 11, University of Guelph-Humber will host a free, interactive, all ages science festival as part of the annual Science Rendezvous, taking place across Canada. Science Rendezvous is an annual event that gets science into the local communities thanks to partners like the University of Guelph-Humber. Festivalgoers get a chance to participate in hands-on-experiments and see amazing scientific demonstrations. At the University of Guelph-Humber, student volunteers will lead activities including anatomy, neuroscience, health & fitness, new technology and forensic science. Attendees will have the chance to look at muscles, fat, the brain, heart and the lungs; assess fitness levels through interactive exercises; learn more about facial recognition, try out virtual reality and even explore a crime scene. More than 300 Science Rendezvous festival events are taking place simultaneously in 30 cities across Canada on May 11.